The SVN Repo Browser allows you to browse from your iPhone® the directory structure of your SVN Repositories displaying the latest repo version, change date and author for each directory or file. Change logs and associated changed file paths can be displayed for any directory or file. Protocols supported are http, https, svn and svn+ssh. User authentication with user name and password is supported for non-public repositories (and required to authenticate via ssh, keys are not currently supported). The app maintains a persistent list of repositories and connects to a repository when the repository's row in the repo list screen is selected. This application requires iOS 9.1 or later and supports the iPhone 4s and all later iPhones. Tap the Repo table row to open repository and display root directory. Tap the '+' button to display the edit screen and enter the details of a new repo into the edit screen shown below. 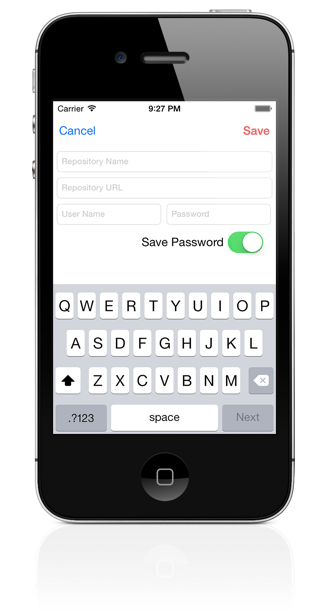 Tap the accessory button to display the edit screen and change the details of an existing repo. Tap the edit button to rearrange the repository list or to delete one or more repositories from the app (or swipe to delete). The repository name can contain spaces. The repository path must start with the protocol (http://, https:// or svn://). User name and password can be left blank if not required for repository access. The Edit (repo details) button is active only for the root directory. To see a directories files and subdirectories, tap the directory row. Tap the accessory button to show the change log for a subdirectory or file and the log button on the lower right of the screen to see the current directory's change log. The Info button on the lower left shows information about the current directory (svn info). Tapping the refresh button on the upper right will reload the directory information from the server. Tap the more button or pull up to load older change log entries. Tap the refresh button or pull down to reload the log entries and display any new log entries. Tap a log entry to see a full comment and a list of changed files. The comment area is scrollable. © Andrew Grant 2014-2018 | Apple, the Apple logo and iPhone are trademarks of of Apple Inc registered in the U.S. and other countries. App Store is a service mark of Apple Inc.